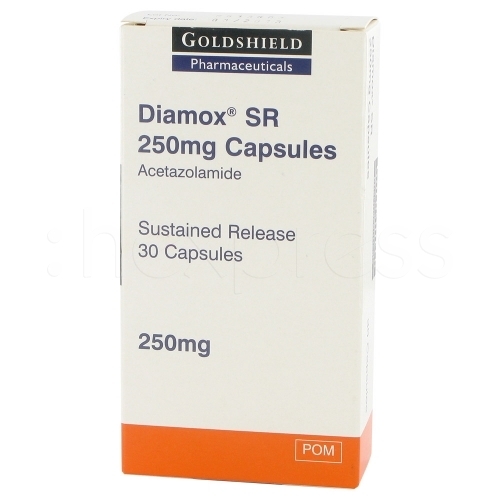 Acetazolamide, also known as Diamox is a type of carbonic anhydrase inhibitor. Basically, carbonic anhydrase is a protein found in the body. Diamox works by minimising the activity of this protein. This medication is used for the treatment of conditions such as acute mountain or altitude sickness and glaucoma. It is also used in conjunction with medicines for seizure disorders and congestive heart failure. Diamox helps to quickly resolve symptoms associated with mild acute altitude sickness. These symptoms include fatigue, headache and feeling light headed. Although the symptoms normally go by themselves in about 24-48 hours, when taking Diamox, the symptoms subside in about 12-24 hours. This medication is also known to minimise chances of experiencing altitude sickness in people who have to ascend without the appropriate acclimatisation. However, the medication must not be used as a substitute for acclimatisation. Diamox is also known to improve breathing patterns during sleep at an altitude. When you sleep at altitude, there are changes in your breathing pattern; usually fast breaths are followed by extended pauses. Although this is not dangerous, it usually results in poor sleep. How do I take Diamox? If you are experiencing early mild acute altitude sickness symptoms such as a headache or fatigue, take one 250mg tablet 2 times daily until the symptoms go away. In the event that you are forced to ascent rapidly without adequate acclimatisation, take one 250mg tablet 2 times daily for at least 2 to 3 days after you reach the final altitude. If your breathing pattern is disturbed during sleep, take half a tablet (125mg) 2 times a day up until you come down to an altitude where your sleep pattern will not be disrupted. Can I buy Diamox online? It is very simple to purchase Diamox online. The first thing you need to do is to complete a free online consultation with a doctor. The process is confidential and it basically substitutes the ordinary face-to-face consultation you have with your doctor in order to get prescription medication. As soon as the medication has been approved, it will be delivered to you within a day. Effective, but not without side effects. The first month was pretty bad – my hands, feet, and legs were falling asleep and I experienced painful tingling and cramps. My joints also had problems, and I had to wear a brace on my knee for a little while. I was more lethargic. Anything carbonated tasted awful. I couldn’t drink caffeine or my whole body would feel weird and tingly. I also had to pee a lot during the first few weeks and was quite thirsty. Over time, most of the side effects went away, and my pressure went down. My vision problems completely went away. However, a new side effect appeared after about two years – tinnitus. It is definitely being caused by the medicine, because I’ve found that skipping a dose makes it go away. I was just diagnosed with IIH/PTC last week. My neuro started me on Diamox the same day. Although I have had tingling in my hands and feet as well as lethargy, the pressure behind my eyes has already started to go down. My ophthalmologist was very pleased today with the optic nerve scan and said there has been decrease of pressure in both eyes. A little tingle here or there and a bit of sleepiness is worth saving my vision! So far, I’m a happy girl! Diamox put me in remission after about six months, but it began to cause tinnitus and hearing problems. My hearing is fine now, but I cannot take Diamox again if my PTC returns. Just something to keep in mind. Tinnitus and hearing issues are considered rare side effects, but they can happen. Diamox changed my life I had 24/7 pressure headache for 7 years of my life I went everywhere even to the mayo clinic and had test after test and scan after scan and finally my local neurologist tried this medication and it has made me able to live again for the first time in 7 years! I was diagnosed with chronic daily headache and told I would never get better but to everyone suffering there is hope don’t believe what a few drs say keep searching for answers. Try this medication if nothing else has worked for you! After several bird tours flirting with 10,000 – 11,000 ft elevation I became suspicious that I was susceptible to alt. sickness. A redirected flight to LaPaz, Bolivia (and some unscheduled ascents near Cochabamba) convinced me I was. Typically I serve as a human altimeter, within minutes of reaching 11,000 ft I’m puking my guts out. Diamox has been a wonder drug in preventing alt. sickness on tours I’ve been on since Bolivia. I’ve travelled from 8,000 ft straight to 14,000 ft several times with no alt. sickness symptoms at all. 125 mg before bed is all I need. Tingling and bad tasting soda symptoms are greatly reduced at that dosage compared to the 250mg I initially used. Hello. I am 18 and I have diagnosed with Idiopathic intracranial hypertension (IIH) December of 2016. As we all thought, I had a concussion because I played volleyball but it didn’t quite flow with the big blind spot in my left eye and the perfect MRI and MRE scan results. Well, as my opening pressure from an LP was 49.7, more than half for my age, and being the first patient for my pediatrician, I have Psuedo Tumor Cerebri. My new neurologists put me on 2,000mg a day. Yes, this caused severe abdominal and GI upset for almost the first month I was taking it and a little bit here and there. My ophthalmologist has seen an improvement. My second LP as of 1/30/17 had an opening pressure of 28.7. They drained me to normal and took 10cc of instead of 8. I hope it keeps working. I have been on Diamox since 2004 when I was first diagnosed with a pseudotumor cerebri. I was hospitalized for 5 days after experiencing paralysis in my legs, severe headaches, nausea and visual impairment. I have tried to stop taking the medication but had to return to it due to the severe headaches and cranial swelling. I have constant problems with electrolyte deficiencies and have to take additional medications to alleviate other problems. This is still the best treatment I have experienced. In addition to this condition, I also have Lupus, HBP, Hypothyroidism and I am Bi-polar. I am 18 years old and I was diagnosed with pseudotumor cerebri after an allergic reaction to long term use of tetracyclines for acne. I went to the ER twice experiencing persistent, debilitating migraines, double vision, and one eye turned to face inward towards my nose, and they were unable to relieve any of it. My eye doctor, after a month of different testing, diagnosed me with pseudotumor cerebri and a neurologist started me on diamox and within two weeks my eye turned straight again, and the headaches and double vision were gone. I experienced the common tingling in my hands and feet, difficulty drinking carbonated beverages, small rashes, and lethargy from diamox, but it was all bearable after a week and within a month I am fixed. Its a good medicine to decrease the Eye pressure. While taking this tab – depression and dark thoughts are more and I have no interest in food, and also my hands tickle like they are in water. Now I’ve stopped the medicine, my eye pressure become normal and constant. After stopping the medicine it takes a few days to decrease all the worst symptoms. I was given diamox to treat bilateral ringing in the ears, headaches and pressure behind my eyes. I am 39 years old and I have lived with ringing in my ears all of my life. I have tried every available option out there to treat tinnitus and nothing has worked. I was referred to a new specialist dealing with ear diseases and he asked me a few questions and then prescribed diamox. Within 2 hours of taking diamox the ringing in my ears stopped completely and the pressure behind my eyes went away as well as headaches I’ve dealt with for years. I was shocked that this medicine is working as one of the side effects was ringing in the ears but I am having the opposite effect.